SwiftDeck is committed to the supply of products sourced from sustainable sources. 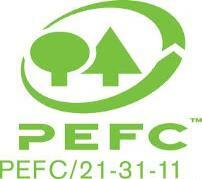 All products we sell are from sources certified by either AFS or PEFC. Our processes ensure we can identify the source of finished products. SwiftDeck is manufactured in only Class 1 and Class 2 above ground durability timbers as defined in AS 5604. 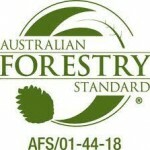 SwiftDeck is profiled from timber species that have been tested for adhesion performance in the SwiftDeck system, and have been included within the SwiftDeck Manufacturing Licence Specification. Ironbark, Spotted Gum, Blackbutt, Silvertop Ash, Jarrah, Karri, Merbau, Yellow Stringybark, White Cypress, Southern Mahogany. Decking surfaces to be SwiftDeck Timber Decking, a system of hardwood decking boards, the SwiftDeck Clip and SwiftDeck approved adhesive; producing decking areas with virtually no visible fixings. 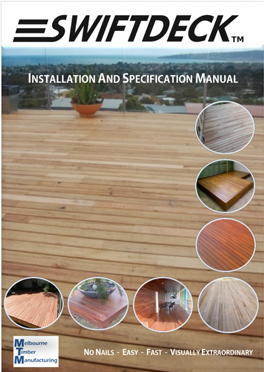 Fixing Decking Boards SwiftDeck nail free decking system, using the SwiftDeck Clip and profiled SwiftDeck decking boards to the manufacturer’s instructions. Approximately 4.2 Clips per square metre are required. Curves and complex shapes may require more clips. SwiftDeck is primarily available in LinkWood Protect™ – prefinished in factory with FeastWatson oil, in set lengths to suit your project, ready for use after the easiest installation available for decking. SwiftDeck is manufactured in only Class 1 and Class 2 above ground durability timbers as defined in Australian Standard A S 5604. LinkWood Protect ™ is solid Australian Hardwood, offering more consistent colour and wider choice, retains design colour longer and requires less maintenance than traditional timber finishes.